China has dominated the news for nearly a decade and will continue to grab headlines as it moves inexorably toward becoming the world's largest economy. It already has the largest middle class in the world; the most Internet users; the largest army; and is the world's largest polluter. Yet all this growth causes problems as China adapts to the laws of other lands in which it has investments; learns how to meet international guidelines and safety standards for its products; stretches its resources to the limit; and struggles to maintain stability and control over an increasingly restive population. China Inside Out explores the social and economic forces unleashed by China's relentless drive to modernization. Bill Dodson presents the stories of average Chinese workers, along with interviews with experts interlaced with his own experiences. The end result is an insider's view of the forces reshaping China as it takes an increasingly prominent role in the new world order. 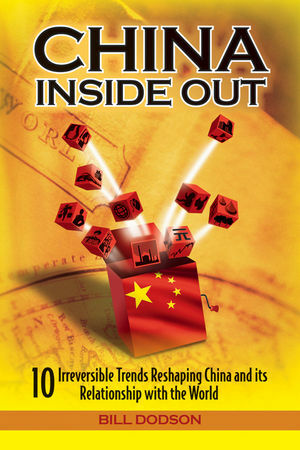 For business leaders, investors, and China watchers, China Inside Out offers a truly in-depth examination of China's changing role in the world. Bill Dodson has been writing and advising on business in China since 2002. He has been quoted on China-related topics in Newsweek, The Economist, Shanghai Business Review, China International Business, China Economic Quarterly, National Public Radio, and others. He is a columnist for the China Economic Review and Eurobiz on economic and foreign investment issues in China. He is a Partner and Director of Strategic Analysis at TrendsAsia Ltd., in Shanghai. You can follow his blogs and podcasts at www.thisischinablog.com. Chapter 1 The Rise of Generation W(eb). Chapter 2 The Anxious Class. Chapter 3 A Tale of Two Countries. Chapter 4 Not in My Backyard! Chapter 5 With the Appetite of a Dragon. Chapter 7 China, at Your Services. Chapter 8 The Global Sugar Daddy. Chapter 9 Hot Pot Nation. Chapter 10 In the Shadow of the Emperors.